In Triumph of the City, Ed Glaeser has written a love letter to his lifelong object of study, the global metropoles in which a majority of the world's population now resides. When planned and managed well, cities exemplify the best of civilization. 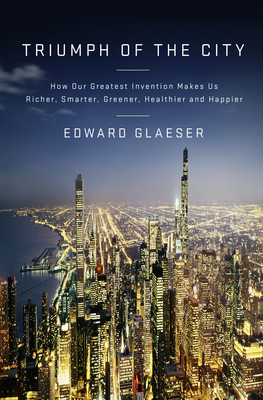 The subtitle of the book, "How Our Greatest Invention Makes Us Richer, Smarter, Greener, Healthier, and Happier," sounds a bit like the sales pitch in an infomercial, but Glaeser's enthusiasm for cities is sincere and infectious. To be precise, the title of the book refers to the triumph of the city, as opposed to all cities or any city in particular. Industrial cities in America, for example, are dead, and this book does not argue for their revival. Whereas some might argue that the ability to conduct many forms of business from virtually anywhere made possible by modern communications have rendered the modern city less relevant, Glaeser maintains that the riches to be gained from agglomeration in the postindustrial urban economy have only begun to be mined. In fact, his is a deeply humanist book, with the "triumph" referring to the heights of invention and creativity achieved when people cluster together. Glaeser conceives of cities first and foremost as consisting of people and connections, and secondarily of places and buildings. Predictable though the comparison may be, it's true nonetheless: Glaeser is Jane Jacobs with a pocket square and, importantly, a spreadsheet. Triumph of the City adds crucial data and analysis to the story that Jacobs first told decades ago, when Glaeser himself was likely toddling about the parks and sidewalks of his native Manhattan. The Jacobs book that he most embraces is not Death and Life of Great American Cities but rather her lesser known but equally compelling Economy of Cities. Glaeser draws on anecdotes of urban success and failure from Manhattan to Mumbai. But it is the abundance of statistical comparisons in Triumph of the City that serve as the real basis for understanding trends and correlations among variables � such as density, education, wealth, and even climate � that one might not normally associate with one another but that, he claims, bear heavily on a city's wealth and success. �	In the average U.S. county with less than one person per acre, 15.8 percent of adults have college degrees. In the average county with more than two people per acre, 30.6 percent of adults have college degrees. �	Second only to January temperature, education is the most reliable predictor of urban growth, especially among older cities. �	When American cities have built new rapid-transit stops over the last thirty years, poverty rates have generally increased near those stops. This doesn't mean, however, that mass transit was making people poor. Rather, poor people value being able to get around without a car and move near the stops. Whether the increase in poverty rates around new rapid transit stops is a temporary phase in the evolution of urban neighborhoods en route to full-scale gentrification, Glaeser does not say. If true, however, this observation upends one of the long-held assumptions in the planning profession about greater accessibility and increased property values�that one will automatically and instantly lead to the other. Perhaps even more surprising is Glaeser's invective against the modern environmental movement. Under the guise of "preservation," environmentalists have imposed strict controls on development in coastal regions that are inherently green by virtue of their mild year-round climate. High median home prices in places such as Santa Clara County are not the inevitable outcome of market forces, but instead reflect a long-term disruption in new supply. Regulatory barriers, which empower opponents of new development, have in effect shunted population growth to areas of the country with extreme weather, such as Phoenix, Las Vegas, and Houston, where the need for heating or air conditioning virtually guarantees a higher per-capita energy consumption. If the environmentalists in California were truly green, they would embrace more development in their own neighborhoods. Glaeser saves special scorn for the California Environmental Quality Act (CEQA), pointing out that it is prejudicial against new development, since it only considers the impacts of a given project against a "no-build" alternative. This is unrealistic, Glaeser points out, because new growth pressures demand a release valve; if denied in one place, development will ultimately pop up elsewhere in a more receptive city or region. Because the natural tendency for people is to agglomerate, any policy that discourages agglomeration under the guise of "preservation" is necessarily self-defeating and an inducement to even further destruction of the environment via greenfield development. For urban infill projects, CEQA's point of reference for assessing greenhouse gas impacts, for example, should therefore be not a "no-build" alternative, but an alternate scenario in which the same project is built in a car-dependent, less temperate environment. Such a scenario would be equally hypothetical�yet more reflective of the real world writ large. Paris offers a cautionary tale of preservationism taken to an extreme, with the city's official building height limits making the center city unaffordable to all except the wealthy. Even the French have begun to debate whether Paris is a "ville-mus�e," or city-museum, prized for its Hausmannian architecture and cultural pleasures but lacking in dynamism or innovation. The fixation on historic preservation attracts millions of tourists each year while stymieing the city's ability to accommodate substantial new and permanent growth. As Glaeser writes, "cities aren't structures; cities are people." For Glaeser, the ability of urban centers to grow "up" and increase densities over time is a key driver of the agglomeration economy, whereby the physical proximity of people to one another allows for the dissemination of new ideas, discovery of individual talents, creation of new industries, capital formation and wealth, which in turn supports the cultural amenities that define "quality of life." These amenities draw even more people, particularly the wealthy, creating a virtuous circle of growth and prosperity. * It's worth noting that the one "amenity" that Glaeser values above all others is education. That's why many of Glaeser's observations owe an intellectual debt to the seminal work of Jane Jacobs � but only partially. Jacobs' bid to preserve Washington Square Park and her beloved Greenwich Village from Moses' wrecking ball was ultimately successful, but in the long term, Glaeser also sees the current unaffordability of this area as a distinct part of Jacobs' legacy. Once a working-class neighborhood, Greenwich Village now boasts some of the most expensive real estate in the country. As Glaeser tells the narrative, its transformation into a wealthy enclave is directly tied to the low-/mid-rise architecture of its townhouses and tenements. Without adequate new supply, prices inevitably go up. This may be part of the story, but Glaeser unfairly criticizes Jacobs for supposedly misunderstanding the long-term economic effect of her own preservationist stance. In fact, Jacobs did not oppose the gradual replacement of older buildings with newer ones; she simply favored retaining some older buildings as part of a neighborhood's real estate inventory because their more affordable rents provide incubator space for small businesses and entrepreneurs. Jacobs' fondness for old buildings is supported by a rationale far more nuanced than the mentality of civic leaders in Paris, many of whom oppose even the slightest alteration to the scale and aesthetic of the historic urban core. Toward the end of the book, the personal stakes of Glaeser's interest in the issue of affordability become clearer as he grapples with his own ambivalence as an urban economist who has decamped to the suburbs in search of cheaper housing and better schools than the nearby cities of Boston or Cambridge can provide. Instead of disparaging McMansionites, urban planners should understand that, for most middle-income families, the allure of suburbia is grounded in rational economic decisions. Compared to urban living, it simply offers more bang for the buck. On the subject of amenities, Glaeser is somewhere along the continuum between Richard Florida and Joel Kotkin. Cities should not tailor their policies to the so-called "creative class," nor should they ignore the important role of amenities in attracting and retaining talent. In fact, if a city has a high median income relative to local housing prices, it indicates that additional pay is needed to draw qualified labor. This is a sign of urban failure rather than success. In cities with a high quality of life, workers will by contrast accept lower salaries because the desirability of the location is itself a form of compensation. To level the playing field and make cities more competitive, Glaeser's policy prescriptions are an amalgam of both left and right: streamline the existing environmental review process with a flat mitigation fee on new development; eliminate city income taxes; impose congestion charging fees on urban drivers as is done in Singapore and London; end the quasi-monopoly of the public school system through vouchers. Ultimately, many of Glaeser's policy prescriptions hew towards the free market. And why shouldn't they? Glaeser argues convincingly that over 4,000 years cities � or, rather, the people who constitute their life force � have performed best when they welcome new arrivals and embrace transformation, rather than regulating new growth out of existence or clinging to failed policies of the past. And that's what makes Glaeser's contribution to the discourse on cities so valuable. He takes great pains not to come off as a heartless free-market economist, instead celebrating the artistry, poetry, humanity and, yes, freedom that constitute the true triumph of the city.